They're already living the good life! Beyonce was released from the hospital with her twins late last week, and the trio headed to this $400K-a-month Malibu rental to settle in and begin their new life together. The singer and husband Jay-Z are renting this oceanfront estate while they continue their search for the perfect permanent LA residence, and they're not exactly roughing it! The mansion, called La Villa Contenta, is currently on the market for $54.5 million, but the superstar couple is only staying until August. The 16,107 square foot pad boasts 10 bedrooms and 14 bathrooms. That should be enough space for the Carter brood and all their nannies! "One of the most significant residential compounds in the United States, La Villa Contenta offers the most prime Malibu location with approx. 6.3 acres of exquisitely landscaped gardens overlooking unobstructed views of the Pacific Ocean. This gated estate with the utmost privacy features a grand main house, extravagant guest house, additional structure of offices and one of the most ornate ballrooms with a beautiful indoor pool. With the finest architectural integrity, quality of construction and imported designer details, this estate is truly for those who demand ultra luxurious living in one of the rarest trophy properties in the world," the listing reads. It's been reported that the newest additions are a boy named Shawn and a girl named Bea, but the pair hasn't put out any announcement or shared any photos or messages on social media. We wanna see pix of the little cuties! This is mighty close to her boyfriend The Weeknd's new pad! Selena Gomez just snapped up this Studio City home outside of LA for $2.25 million, and for someone that's worth more than $50 million, we're a little confused why she chose such a modest place. The 3,188 square-foot abode boasts 3 bedrooms and 2.5 bathrooms, a large backyard pool and a music room. The residence, built in 1953, has been completely refurbished, so it's unlikely she purchased it in order to flip it. But is she actually going to live here? Maybe she plunked her money down here as an investment property, or she's giving her mom Mandy some new digs. The "Come & Get It" songstress sold her starter home in the City of Angels to Iggy Azalea for $3.45 million in 2014, and she's also currently looking to unload her place in Texas for $3 million. She's probably going to store her stuff here and spend all her time at the Starboy's new $18 million Hidden Hills mansion. He needed an East Coast crash pad! Ryan Seacrest just snagged this $75K-a-month NYC rental after it was announced that he's going to be Kelly Ripa's new co-host on Live!, and he's certainly not going to be roughing it during his time in the Big Apple! 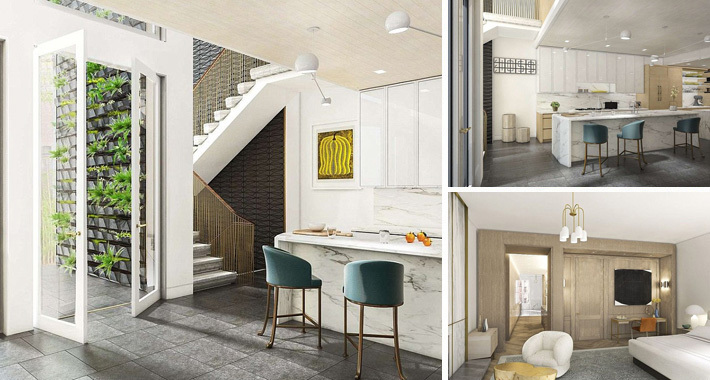 The 11,000 square-foot abode, located in the Lenox Hill neighborhood of the Upper East Side, is modern and sleek and perfect for a semi-bachelor. The TV personality is dating model Shayna Taylor, but we have a feeling she won't be around for long. When is he going to find the time for romance? The home, built in 1879, was bought by a developer in 2015 for $11.5 million and put on the market in April. It has high ceilings, stunning views, a marble chef's kitchen, and plenty of outdoor space for entertaining. Not that he'll spend any time here with his insane work schedule, but still! Wow! Angelina Jolie has paid a record price for the landmark Cecil B. DeMille estate in Los Angeles -- a perfect 7500-square-foot home in which to raise her six children. With rolling green lawns, six bedrooms, ten bathrooms, and pool. The home was built in 1913 in the Los Feliz neighborhood of LA and the famed director lived there until his death 1959. It features a wood-paneled library, a tea house, and a farmhouse-style kitchen. After Jolie filed for divorce from Pitt back in September, she's been in hiding with her children and keeping a seriously low profile. 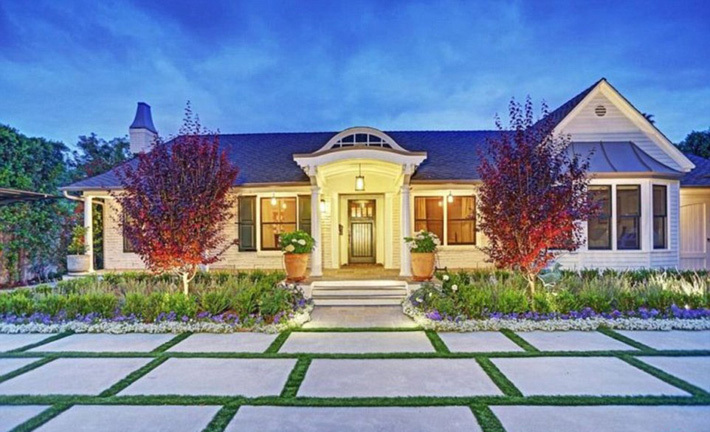 Does this purchase and move into a "home base" mean that she's ready to take on Hollywood again and be in the spotlight?